As the name represents, the Green Vegetable Salad with Garlic and Ginger is an invigorating mixture of some fresh green aromatic vegetables. This refreshingly light summer salad can be served hot or cold. The smell of steamed vegetables automatically charges your taste buds. Take a large saucepan or steamer pot and pour in water, until right below the base of the steamer’s basket. Now, bring the water to boil over medium heat. Meanwhile, drain the fresh broccoli, place on a cutting board and cut into small florets. 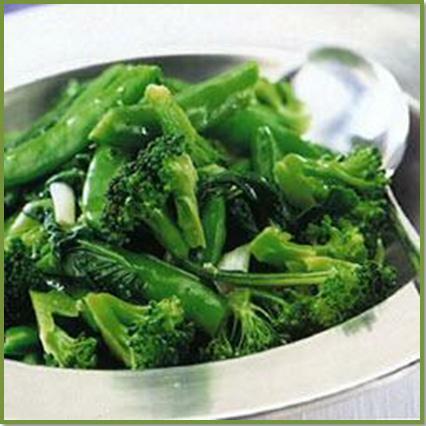 Peel the remaining stalks of the broccoli and cut them into fine slices, cutting diagonally into thin slices. Set the slices aside. Cut the baby buk choy and thinly slice their stems. Trim the 4 spring onions and slice them thinly diagonally. Take a large bowl and add in broccoli slices, buk choy, finely sliced spring onions and add in 250g of trimmed sugar snaps peas. Toss the ingredient to mix them and add in crushed clove garlic along with finely grated ginger. Mix the ingredients once again and gently transfer the mixture to the boiling water in the steamer basket or saucepan. Cover the saucepan or steamer basket and steam the ingredients for around 4 to 5 minutes or until crispy tender. Shift the vegetable mixture into a large salad dish and set aside until you make the dressing. Pour in the fish sauce and top it with brown sugar. Stir until the sugar dissolves completely. Drizzle the sugar-sauce dressing over the vegetable mixture in the bowl and toss lightly until coated. Serve the salad warm or place it in the refrigerator for some time if you'd like to have it chilled.